Whether you're betting on Eagles @ Cowboys, Bears @ Lions or Seahawks @ 49ers, Intertops Sportsbook has a number of tailored offers to suit all bettors this Thanksgiving week. With three games on the NFL schedule on Thursday, the world's oldest online sportsbook has two stake-back offers, a no-juice line, and a special Facebook competition with $100 in free bets at stake. As the Cowboys host the high-flying Eagles there's a stake-back of up to $100 available on the '1st Half Spread' market if a team leads at half-time and doesn't win, while a separate stake-back offer is available in the game featuring reigning Super Bowl champions Seattle - also up to $100 - is Seahawks QB Russell Wilson or his 49ers counterpart Colin Kaepernick scores a rushing TD. 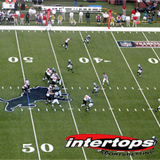 The no-juice line comes in Detroit, where 7-point favourites the Lions host the Chicago Bears, while Intertops Sportsbook has also thrown an attractive Facebook promotion into the mix: just wager on the action and correctly predict all three Thanksgiving results on the Intertops Sportsbook Facebook page (https://www.facebook.com/pages/Intertops-Sportsbook/187827664583233) to be entered into a draw to win $100 in free bets. Not bad, eh?